Chocolate is often referred to as the “food of the gods”. Of course this relates to the heavenly taste of chocolate and the pleasure of indulgence in it, but there is more to it than that! The phrase may have its roots in the pre-Colombian religion which first cultivated cocoa and consumed it as chocolate. 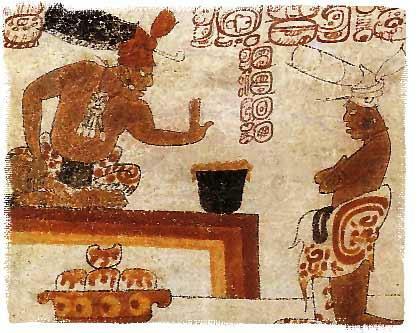 The Aztecs worshipped the feathered god and Toltec king, Quetzalcoatl, who brought cocoa to earth as a gift to humans. Quetzalcoatl was banned from the land after serious quarrels with the high priest Tezcatlipoca. He escaped on a raft to the open sea. For eons, the Aztecs believed that Quetzalcoatl would return to his country in the year 1519… the very year the Spanish conquistador Cortès and his men first landed in Mexico in the new world, on exactly the same spot that Quetzalcoatl had escaped from as he sailed out to sea. No wonder that the Aztec emperor Montezuma mistakenly took Cortès for the returned Quetzalcoatl. Since they used to offer cocoa to Quetzalcoatl, this was exactly what they did to the surprised, somewhat disappointed Cortès, who had expected gold instead. Very soon though, Cortès discovered the economic value and the cultural importance of cocoa to the Aztecs: it started with a gift from the new world to the old world, but what an impact it had! The Mayans worshipped a god with a black face and a long nose: the cocoa god Ek Chuak. Furthermore, vases filled with cocoa beans were a common offering to the gods at the funerals of leading men in Mayan history. The Mayans, and later the Aztecs, were the first to “cultivate” cocoa which they called “cacau”. It was one of the precious ingredients for the preparation of “xocoatl”, a dark, bitter and spicy chocolate drink. It was very different in taste and composition from what we know as chocolate today and was prepared for special occasions such as religious ceremonies and celebrations. Anthropologists have discovered that cocoa was already playing an important economic and social role in the communities living in the Ulúa valley in Honduras about 4000 years ago. In the Mayan and Aztec culture, cocoa was not only the precious ingredient for their “xocoatl”, it was commonly accepted as currency. In fact, it was its economic value that made cocoa so appealing to the Spanish conquistadors. They used cocoa and cocoa beans to buy pumpkins (4 beans), slaves (100 beans)… from the Aztecs, who had developed a monetary system based on cocoa: 400 cocoa beans equaled 1 zontle, 20 zontles equaled one xiquipil. The first cocoa plantations were cultivated around 1550 by the Spanish colonialists in Mexico. To suit the bitter drink to the taste of the Europeans there, a community of nuns in Oaxaca started to add cane sugar, anis and cinnamon to the recipe. From then on, the appeal of chocolate began to spread to the entire colonial population in Central and Latin America. Similar testimonies of scientists, doctors, anthropologists in the 17th century allocated some remarkable health benefits to cocoa and chocolate. They were based on personal experiences rather than on scientific proof. What a contrast to what the European clergy thought of chocolate, as “a sinful temptation” and a “food that evokes lust and decadency”. Chocolate was introduced to Europe – exclusively in Spain – in the 16th and 17th century. The consumption of chocolate was an exclusive privilege for the aristocracy and the clergy at the royal courts. Chocolate wouldn’t become accessible to large populations until the beginning of the 20th century, the period in which the industrialization of chocolate production really began. But even then it remained an adult luxury product, only for special occasions, celebrations or tender moments between friends and lovers. Noble ladies made a habit of consuming chocolate during the long church service hours. This enabled them to withstand the tedious prayers and sermons without getting faint or hungry. The clergy did not approve of these habits and tried to ban chocolate consumption, regarding it as sinful. The Spanish defended their monopoly on chocolate until the 17th century. Then an Italian, Antonio Carletti – who often travelled to the West Indies and to Spain – discovered and published the recipe for sweet chocolate in his travel reports. The Italian people immediately fell for the divine, sweet taste and many "cioccolatieri" were established in the north of Italy with Perugia as the chocolate center and Venice as the cradle for the first chocolate shops. Chocolate has not always been the hard, shiny crunchy delicacy we know today. Until halfway through the 19th century, chocolate was mainly consumed as a drink: pressed “cookies” of chocolate powder were stirred into and dissolved in hot milk or water. The invention of the cocoa press by the Dutch Coenraad Van Houten in 1828 gave industrial food manufacturers the first stimuli and tools to develop our “modern”, solid chocolate. Historians still argue about who was the first to have produced chocolate in its solid form, but the British Fry family claim to have marketed the first ever chocolate bar. Van Houten also invented the “dutching process”. By adding natural alkali to cocoa powder, the cocoa gets a darker color, a lighter taste and it becomes more soluble in water. When did children first get into chocolate? The first signs of chocolate being marketed to children only date from the 1930’s. By that time chocolate had become widely accepted as nutritious and average household income was on the rise. Marketeers saw this as an opportunity to give chocolate a young, fresh image. Packaging design and product development really focused on youngsters, to develop their taste for chocolate. Needless to say, they succeeded very rapidly.